What does it do? If you use PowerPoint presentations in your classroom, Slideshare is a great way to share them with your students on-line without having to maintain a class website, Wiki, or Blog. In plain English, this means that you can put your presentations on-line and then simply provide a link for your students. That’s it! Extra information: What I really like about this site is that you don’t even need to create an account to view or even upload PowerPoint presentations. However, if you plan on using this site on a regular basis, it would be advisable to sign up for a free account so that you can keep track of previous slide shows that you uploaded. ICT Tip: If you’d like to know more about PowerPoint, first view this video tutorial link for a brief overview by Don Shecter at about.com. 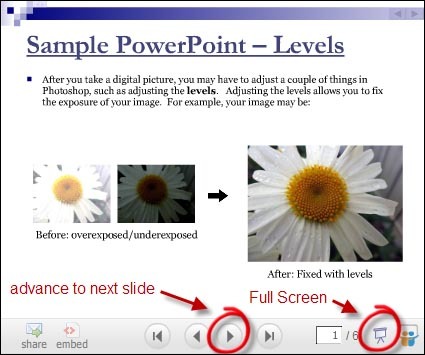 If you’d like to know more about using PowerPoint in your classroom, then check out Robert More’s (ACCESS Adult Education Centre, Riverside School Board) RECIT project entitled “PowerPoint: Technology for the Non-Technical Teacher” at this link. This entry was posted in Tools and Apps and tagged pdf, powerpoint, ppt, slideshare. Bookmark the permalink.